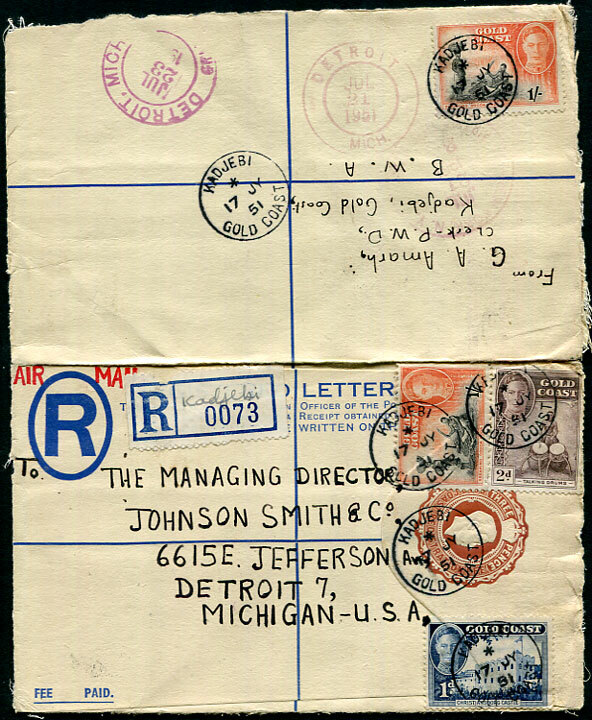 1951 use of KG6 3d PSRE with added KG6 1d, 2d, 2 x 1/- pmk'd KADJEBI */17 JY 51 cds to Detroit, Michigan, opened-out for display. 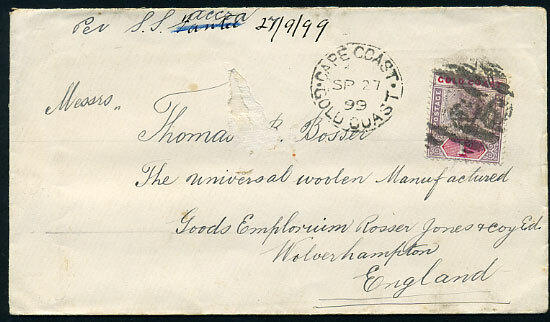 A postal agency under Hohoe, Togoland. 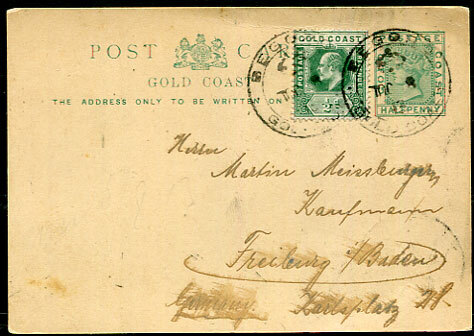 1913 use QV ½d Post Card with added KE7 ½d to Freiburg, Baden, Germany dated 8 JUL 13, full reverse text. 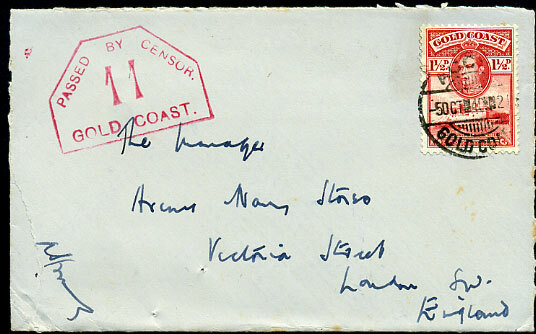 in red on KG6 1½d cover to England pmk'd Accra 5 OCT 40.
in purple on KG6 3d cover pmk'd Accra 13 DE 40, sender's address portion on flap removed. 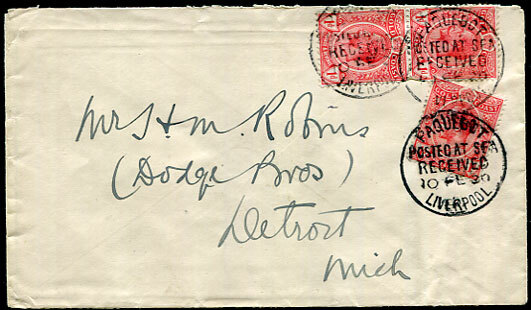 in red on KG6 1½d cover pmk'd Accra 12 JAN 42. 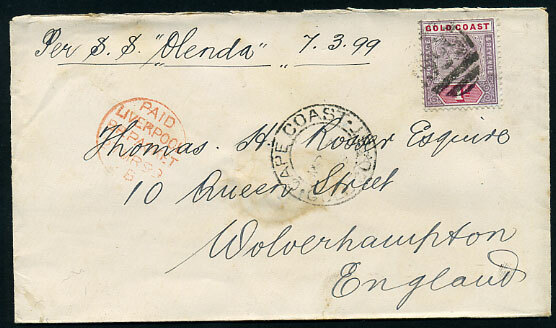 CAPE COAST, Gold Coast per S.S. "Olenda"
on full cover dated NO 18 99 to Wolverhampton (DE 7 99 arrival). 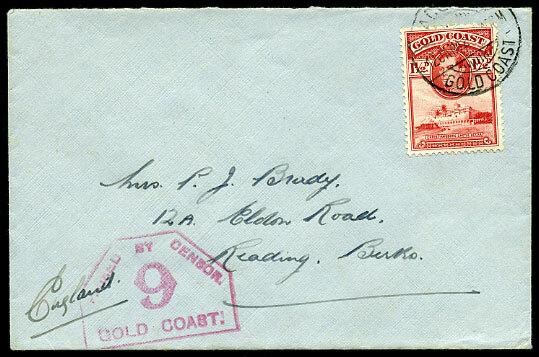 CAPE COAST, Gold Coast per S.S. "Fantee" changed S.S. "Accra"
on full cover dated SP 27 99 to Wolverhampton (OC 17 99 arrival), internal fault on address panel. 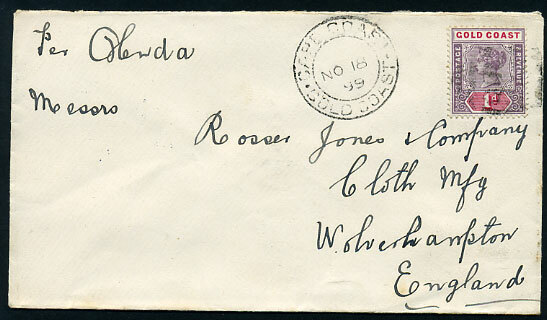 on full cover dated MR 7 99 to Wolverhampton (MR 27 99 arrival). 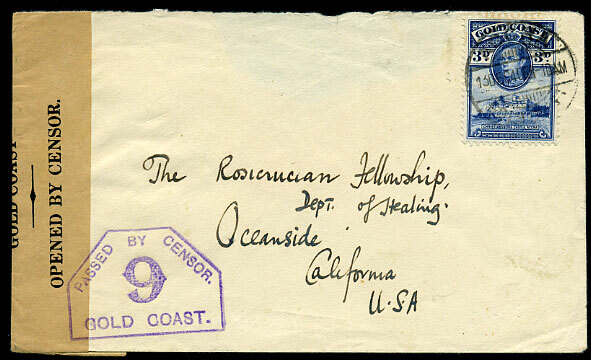 Central stain from wax seal. 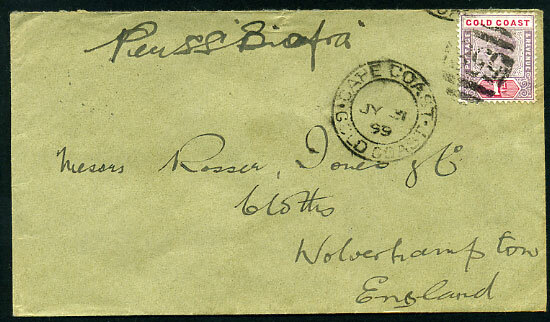 CAPE COAST, Gold Coast per S.S. "Biafra"
on full cover dated JY 31 99 to Wolverhampton (AU 20 99 arrival). 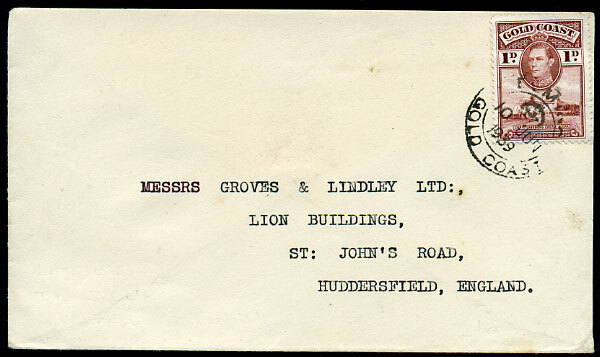 ELMINA/(crown)/10 JUN 1939 (Type 14, late use), on full cover KG6 1d cover to Huddersfield.